Description: 34M comes off the 2 Runner and heads through CP-Belt. Description: NS 544 westbound with Cleveland's skyline as a backdrop, note the renovation to The Terminal Tower (far left). To the right is Clevelands light commuter rail service known as RTA. Title: NS 9240 and her train sit in the control siding awaiting clearance into Allentown Yard. 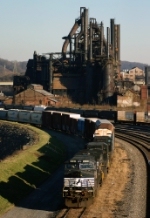 Description: NS 9240 and her train sit in the control siding awaiting clearance into Allentown Yard with the old blast furnaces from Bethlehem Steel looming in the background. Description: 213 blazes south as P61 heads west onto the S-Line. Description: This horse relaxes in the warm evening sun and moon on the CHW Yard. Description: Coming down main 1 10N will soon reach the tail end of 22W.